Once you’ve hit the road in your new RV, you probably have an idea of where you’re going, what you’ll be doing, and where you’ll be staying. But what about what you’ll be eating? November is here, and we’re welcoming it with open arms! Chilly evenings by the fire, cool afternoons hiking, and beautiful colorful scenery! And of course, while camping, you can still enjoy the pumpkin pie with this fall camping recipe! 1. Heat oven to 375°F. Spray 18×13-inch rimmed sheet pan with cooking spray. 2. Separate each can of dough into 8 rolls (cover and refrigerate icing for later). Cut each roll in half crosswise to make two thin rolls. Place rolls in a single layer in pan; let it stand 10 minutes. Pat and press rolls to stretch and completely cover bottom and slightly up sides of pan. 3. Mix eggs, sugar, pie spice, pumpkin, 1 1/2 cups whipping cream and the maple syrup in a large bowl with a whisk (blend together well!) Pour and spread filling over the cinnamon roll crust. 4. Bake 33-38 minutes, or until edges are golden brown (make sure the center is finished, as well!). Cool completely in pan on cooling rack, about 1 hour. Refrigerate 1 hour before cutting and serving. 5. In a large bowl (chilled), beat 1 1/2 cups whipping cream and the maple extract with electric mixer on high speed until soft peaks form. The pumpkin recipe season is finally here, so why not enjoy it on your next camping trip? With these 5 easy steps, you can create a delicious pumpkin pie that the whole family can enjoy right in your RV. 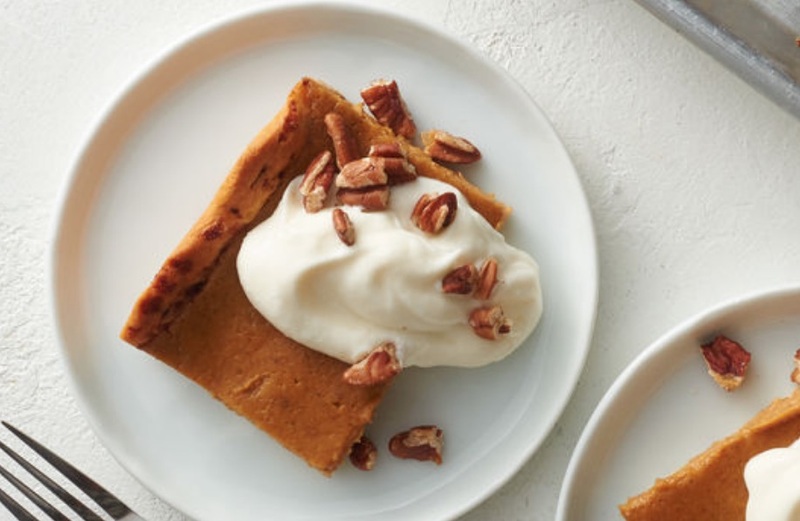 If it’s too cold to be outside, or it’s a bit rainy, this is a great way to spend the afternoon: making the best maple pumpkin cinnamon roll slab pie you’ll ever experience. The name of the recipe may be a mouthful, but it’s the most enjoyable mouthful you’ll experience this fall! If you have any further camping questions, please contact us today. Happy camping and enjoy your dessert!